Home Blog Ask Spanco: Which Overhead Crane Meets Your Needs? Ask Spanco: Which Overhead Crane Meets Your Needs? 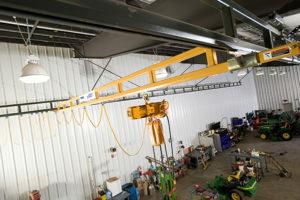 I have always wanted an overhead crane in my factory, and now that I finally have a shop space big enough to actually utilize such a thing, I’m looking at my options. I did some searching around and found a lot of info on them, but can’t seem to find the right system. Looking at a light duty 1 or 2 ton setup…. can you tell me which system would best fit my needs? It would be nice it it could span the width and length of the workshop area (40′ x 40′). The overhead crane industry is an unusual one, particularly because it lends itself to multiple designs and lifting styles. There are three main types of cranes that fall under the category of overhead cranes: jib cranes, bridge cranes, and gantry cranes. Within those classifications—and without knowing your application—I would recommend one of two systems for your facility. To begin, you could go really small and low cost by considering a gantry crane. They move manually or electrically, and some of them can be track-mounted along your workshop area for straight movement across a specific path. 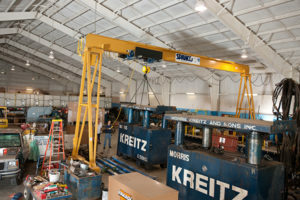 The gantry crane provides portability and easy movement, but it is not—quite literally—overhead. Since your application is unclear, I can’t speculate whether or not this would be the best solution for you. If you are looking to move a load from one end of the shop to another, and height isn’t a factor, a gantry crane will do the job nicely. However, with your 40 by 40 workshop, a better solution is most likely a workstation bridge crane. They are literally overhead—either freestanding or ceiling-mounted—and they consist of an enclosed track runway that can span the length of your facility and an enclosed traveling bridge that one worker can move quite easily. The enclosed track allows the bridge to move along the runway without getting stuck and with very little momentum to propel it along. They can, however, also be motorized on the x- and y- axis, meaning that the load can move in either direction, as well as up and down, using a control pendant. This is great for applications where the operator can’t pull the load across the workshop floor due to ground obstructions or unsafe conditions.